Signing the agreement are Alan Raymant, Horizon Nuclear Power’s Chief Operating Officer and Professor John G. Hughes, Vice-Chancellor of Bangor University.Bangor University and Horizon Nuclear Power, which is owned by leading global electronics company Hitachi, Ltd., have signed a formal Memorandum of Understanding which will enable both organisations to collaborate and work more closely together in future years. The University and the company have been meeting regularly for some time now so that the company can better understand the skills and expertise offered by the University and the University can, in turn, gain a better appreciation of the company’s potential future needs for both research support and also well qualified graduates in various disciplines in future years. 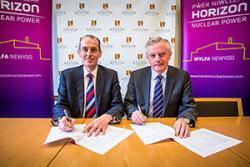 Discussions have now led to the signing of Horizon Nuclear Power’s first Memorandum of Understanding with a Welsh University to work together in respect of their Wylfa Newydd nuclear power station new-build proposal in North Wales. - Student employability and work placements within Horizon as well as activities related to longer-term graduate employment in North Wales. - Collaboration and support for research in relevant areas undertaken by the University, including potential collaboration in the provision of research facilities. - Collaboration in education engagement activities, linked in particular to promotion and awareness of science, technology, engineering and maths (STEM) subjects. 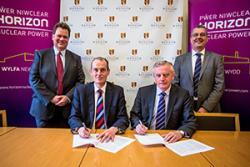 Professor John G. Hughes, Vice-Chancellor of Bangor University said: “Given the enormous scale of investment being made by Horizon in Wylfa Newydd, to create a facility which is likely to operate for many decades, the signing of this Memorandum of Understanding represents a significant moment for both our organisations. “I am delighted that we now have in place a formal framework which will enable us to work together, for both our mutual benefits and for the benefits of the local and regional economy, for many, many years to come”.